There are some things you just don’t ever think about until faced with them, like how to create egg fried rice without egg! I have always loved this slightly stodgy, warming, comforting dish and the fact it is a great way to use any leftovers up. So I wanted to find a way to recreate it without egg. Cue the Tofu! Tofu is a weird and wonderful ingredient that before J’s allergies I had only ever had as a slightly slimey, tasteless substitute to meat. I have now discovered its versatility though. It is great in baking, especially brownies, and I am now experimenting with it in savoury dishes. It creates the perfect texture for egg fried rice and adding the tumeric gives it an authentic colour and also a depth of flavour. Silken Tofu as scrambled egg. This is a basic storecupboard version of vegan egg fried rice but I always add whatever vegetable I fancy or have in the fridge. If, like us, you are not actually vegan then add your favourite meat or prawns to the dish. I served ours with chicken and it worked great. Yum Yum! A great vegan meal. Cook rice and leave to cool. Drain any excess water from the tofu and mash with a fork until broken up. Mix in tumeric and black pepper. 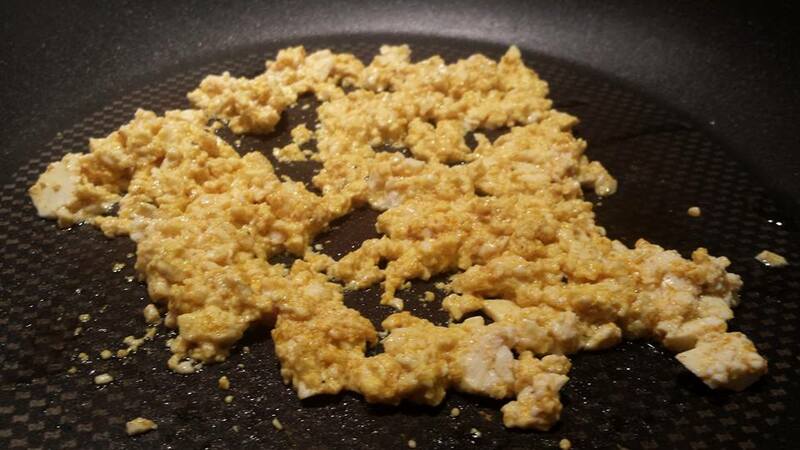 Put 2tbsp oil in a pan and fry tofu gently for 10 mins. Remove from pan. Add remaining oil and fry onions for 3 mins. Add defrosted sweetcorn and peas and fry for a further 3mins. Stir in rice and soy sauce until coated. Mix in tofu and serve. Do you have any great savoury meals with silken tofu? Or know any other ways to substitute the egg? I would love to hear them. This is such a great idea Emma! I love egg fried rice and my little one has not been able to have it because of her egg allergy. Must try! Let me know how you get on, hope you all enjoy it. Great idea Emma! Tofu is pretty weird isn’t it but like you say it does actually come in handy sometimes! 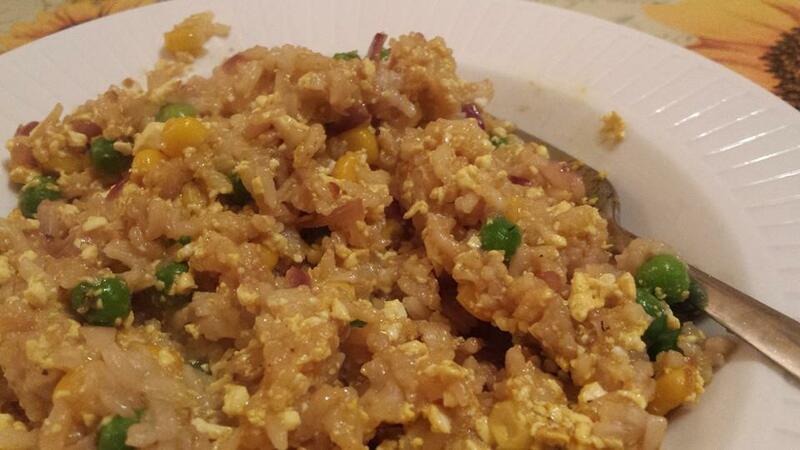 We strangely had egg fried rice tonight…but with the egg since our daughter can now eat it! That’s a great idea. 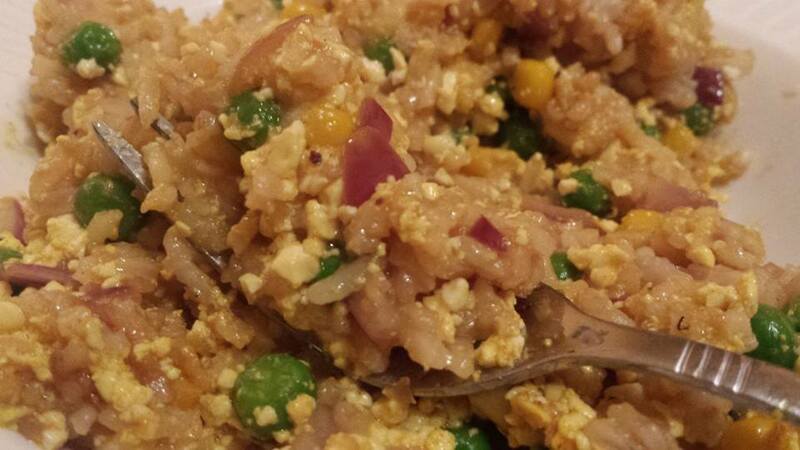 Egg fried rice is one we’ve really struggled to get right!